This article first appeared in Enterprise, The Edge Malaysia Weekly, on February 12, 2018 - February 18, 2018. The circular economy — which ensures that products and materials are at their highest utility and value at all times — does not just make environmental sense, but also presents a huge business opportunity. Those who are early to the game and have implemented all the rather complicated systems to take advantage of this opportunity, which has been valued in the trillions in Europe alone over the next decade or so, could very well clean up. IBM Finland enterprise sales unit executive Kari Huoponen defines the circular economy by contrasting it with the status quo — the linear economy. “The linear economy is where a product is taken from the cradle to the grave — you source the raw materials, use them to manufacture a product, use the product and throw it away at the end of its lifecycle. Most of it ends up in a landfill somewhere,” he says. “With the circular economy, everything keeps circulating and nothing [or very little] goes to waste. For organic or biological matter, you use it and then you return it to nature. Take cotton clothing. First, it is reused as second-hand apparel before crossing into the furniture industry as fibrefill in upholstery. Later, the fibrefill is reused in stone wool insulation for construction before the cotton fibres are safely returned to the biosphere. In each case, the process is a substitute for an inflow of virgin materials into the economy. As can be seen, this takes recycling to a whole other level. “Recycling is good, but we can do a lot of things with the materials before recycling,” says Huoponen. He adds that if you can’t do any of this, then it goes to the waste or landfill. But even then, you could burn it to extract the final element of energy. When all possible use has been extracted from the product, its components — and even the basic elements that make up the components — can be recycled. “So these days, less than 0.5% of the materials that are returned to IBM goes to the landfill. We either refurbish, reuse or repurpose the other 99.5%,” says Huoponen. In Waste to Wealth: Creating Advantage in a Circular Economy, authors Peter Lacy and Jakob Rutqvist paint a rosy picture of the economic opportunities afforded by the circular economy. “Our research indicates a US$4.5 trillion reward for turning current waste into wealth by 2030. That is not just waste in the traditional sense of rubbish, but the enormous under-utilisation of natural resources, products and assets. It is about eliminating the very concept of waste and recognising that everything has a value,” they point out. How do companies participate in this economic opportunity? “First of all, ideally, when companies design products, they should take the circular economy into consideration. This relates to the actual design — how you record, how you document all the materials that go into the product. And so, you create some kind of DNA or fingerprint for the product,” says Huoponen. Second, there are many parts of the ecosystem that need to be developed to prepare for the circular economy, such as reverse logistics, which allows products to go back to their manufacturers to be disassembled, mined and remade into something new. The reverse logistics component of this ecosystem alone would include delivery chain logistics, sorting, warehousing, risk management, power generation and even molecular biology and polymer chemistry. With cost-efficient, better quality collection and treatment systems and effective segmentation of end-of-life products, the leakage of materials will decrease, supporting the economics of circular design. “For our planet, it is important that we reuse materials, especially things like rare earth metals. There is going to be a severe shortage of these materials. So, it is important that we get them back from end-of-life products,” says Huoponen. 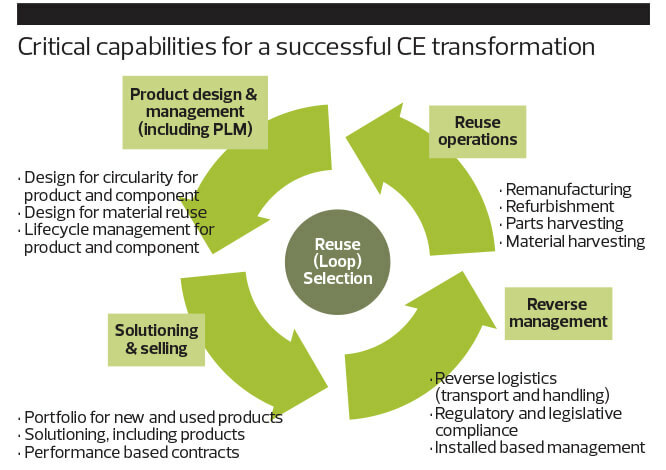 But this is not the only role that IBM can play in the circular economy. “Here in Europe, both in the Netherlands and Belgium, we have quite a lot of projects in the construction industry,” says Huoponen. He adds that IBM is working with some innovative real estate development companies to help them transition to the circular economy. Basically, it has developed the underlying IT system to help these companies identify the materials that go into a building so they can be easily extracted and repurposed should the need arise. “If there are changes to the building, say, they need to remove a wall, they will know exactly what materials are in that wall and they can use them for other purposes, either recycling them or taking the basic elements out for other purposes. You can easily redeploy electric wires or water pipelines, but concrete is more difficult. You could probable use the concrete to build new roads, but you can’t really reuse it for the same purpose,” says Huoponen. The potential benefits are huge, but companies need to get in early and start developing their systems for things such as manufacturing or remanufacturing, materials reuse, parts harvesting and reverse logistics. While the concept is still fairly new in Asia, Huoponen points out that the circular economy was first mentioned in European Union policies only five to six years ago. So, companies that are eager to participate in what is certain to become one of the most lucrative industries in the world already have access to resources that were developed in these countries. For instance, there are free resources on the Ellen Macarthur Foundation website as well as various groups abroad, such as the Climate Leadership Coalition — an international policy institute, founded in collaboration with the who’s who of business, opinion and environmental leaders, to promote a carbon dividends framework as the most cost-effective, equitable and politically viable climate solution. As Malaysia is a greenfield when it comes to the circular economy, there are plenty of opportunities available. “This is becoming big business. So, if you are in there early and you develop your systems, you can really grow and make a profit,” says Huoponen.